A new machine lets first responders find people trapped at disaster sites by detecting individual molecules of breath, sweat, and urine that float up through the concrete. Firefighters and other first responders rushing to collapsing buildings and disaster situations will soon have a new weapon in their arsenal, replacing dogs, cameras, and robots: a series of sensors that find individual molecules of sweat and spit coming from victims trapped under concrete, locating them by their emissions. The high-tech emergency solution, which was unveiled in a research paper for the actually existing Journal of Breath Research, was created by a joint European team that reconfigured a series of commercially available detectors to hunt for unique human emanations. These sensors, normally used for scientific research, turned out to easily detect the breath, sweat, and urine from volunteers who pretended to be disaster victims trapped in a collapsed building, even while the faux victims were stuck under simulated concrete. The sensors were able to detect carbon dioxide and ammonia, along with compounds such as acetone and isoprene, through air flumes. The project was funded by the Second Generation Locator for Urban Search and Rescue Operations, a European Union-affiliated project devoted to cutting-edge first response research. According to study co-author Paul Thomas of Britain’s Loughborough University, “this is the first scientific study on sensing systems that could detect trapped people.” Thomas emphasized that once the device is bought to market, it could replace the use of dogs to sniff for disaster victims–which is highly expensive and places both the handlers and the dogs at risk. Given that this is the first study of its type, it will be quite some time before emergency first responders can take breath-and-sweat detectors to disaster scenes. 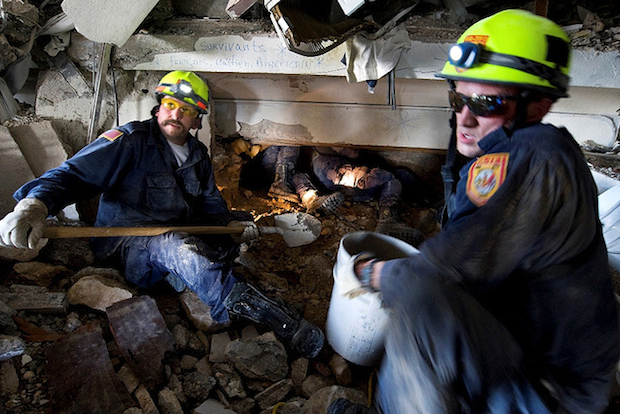 A second round of tests is expected to begin in the near future with volunteers who will stay in a faux-collapsed building for an extended period of time; Thomas and his team expect to find a different set of compounds coming off of victims in extended-duration building collapse situations, situations that would mimic what rescuers found in the aftermath of the Haiti earthquake. It will be several years before the first technology incorporating these discoveries makes it to market–but the European Union (among others) is paying close attention.